BUCKSPORT, S.C. (AP) — The last community in the way of Hurricane Florence’s floodwaters as they slowly flow to the sea got some good news Wednesday — the predictions aren’t as dire as they once were. And it appears the Waccamaw River won’t top a lake of coal ash or the main highway to Myrtle Beach. Officials originally expected flooding in the worst areas of Georgetown County to be from 5 to 10 feet (1.5 to 3 meters). But the latest forecast lowered that estimate to 2 to 4 feet (0.6 to 1.2 meters), according to the county’s Facebook page. 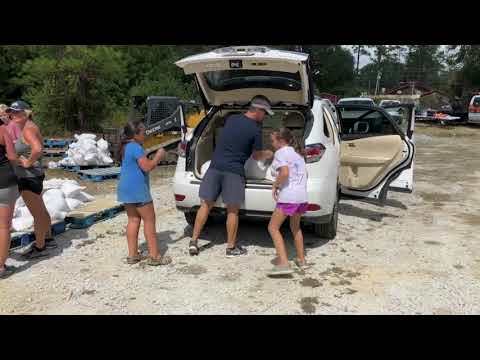 Twelve days after the once-fierce hurricane arrived on the coast, and more than a week after it blew north and dissipated, rivers swollen by its relentless rains are still flooding homes and businesses in their paths as they make their way to the sea. And even the new flooding forecasts are still well above records set just two years ago by Hurricane Matthew. The death toll from the storm is still adding up. North Carolina officials blamed the death of a 67-year-old man who fractured his neck cleaning up storm debris Sept. 18 in Craven County on the storm. Florence has killed at least 47 people — 36 in North Carolina; nine in South Carolina; and two in Virginia. In many places in the Carolinas, the damage is already done. North Carolina agriculture officials estimate $1.1 billion in losses from Florence, most of it done to crops in the field. That was nearly three times the damage reported by farmers from Hurricane Matthew in 2016. Agriculture Commissioner Steve Troxler said the losses this year were greater because harvests were underway or just getting started. Preliminary estimates show about 2,000 homes have been damaged by flooding in South Carolina, with half of them suffering major damage or being destroyed, said state Emergency Management Division Director Kim Stenson, adding those numbers are far from final with flooding still occurring that could affect hundreds or thousands of additional homes. Ivory Williamson took a boat Wednesday to check on her home she left four days ago in Bucksport, a small inland community about 12 miles (19 kilometers) from Myrtle Beach near the confluence of several rivers. Water is all over her yard and covers the roads, streets and buildings. It is worse than the 2016 flooding from Hurricane Matthew, she said. The flood wasn’t going to go away quickly. The newest predictions from South Carolina officials moved back the peak of the flooding from Thursday to either Friday or Saturday in Georgetown County, where the most seriously flooded waterways — the Waccamaw and Pee Dee rivers — meet three other rivers on their way to the Atlantic Ocean. “We are still in full battle mode in Georgetown County,” McMaster said at a news conference Wednesday. There appeared to be good news in Conway, too. The Waccamaw River, which flows through the city of 23,000, spent more than a day at just over 21.1 feet (6.4 meters), some 6 inches (15 centimeters) under the predicted crest. That averted potential environmental and transportation problems. The river water stayed 1 foot (30 centimeters) below a coal ash pond at a closed power plant in Conway, according to the state-owned utility Santee Cooper. The floodwater from the river also had not made it over a temporary barrier quickly built on U.S. Highway 501, the main link to Myrtle Beach. Water is touching the barrier of sand and plastic called the Lifeline, but is still well below the top of it, according to the state Department of Transportation. The lawsuit said the underpass also created a gap in a levee that made flooding worse during Hurricane Matthew in 2016 and cited a report in May where the state called for a floodgate. CSX issued a statement that it doesn’t comment on pending litigation, but noted the “extraordinary storm” devastated Lumberton and other communities with its flooding. Also in Robeson County, Sheriff Kenneth Sealey said his deputies with help from National Guard high-clearance trucks rescued 400 animals — which included dogs, cats, horses, peacocks, chickens, quail and potbellied pig — from a flooded property after some were seen stranded on a rooftop in the Orrum community. About 300 more animals were found dead on the property over the weekend, Sealey said. But even in places that saw the worst of Florence, there were signs that life was returning to normal. In Wilmington, North Carolina, where swollen rivers cut off the city of 117,000 people from the rest of the country for several days, the University of North Carolina at Wilmington will restart classes on Oct. 8, Chancellor Jose Sartarelli said. Collins reported from Columbia, South Carolina. Associated Press writers Jonathan Drew and Gary D. Robertson in Raleigh, North Carolina; and Tom Foreman Jr. in Charlotte, North Carolina; contributed to this report.